So, what’s in my gym bag…? On the rare occasion that I actually get to the gym, you can bet my gym bag is ALWAYS ready to go. My aqua Lulu bag sits strategically in my closet, full of must-have, gym essentials, begging to go for a trip much more frequently than my schedule allows these days. With all of the miles, an adequate [building to great] home gym, and a real gym that is a solid 35 to 40 minute drive from home – I just don’t spend as many hours in this place that was once known as home away from home. But, blame it on my planner, OCD-like tendencies, I’m still prepared – just in case someone waves a magic wand and adds another few hours to the day. Shoes: Most gyms frown upon barefoot feet. They really don’t live up to a no shirt, no shoes, no problem philosophy. So, do not forget to cover your footsies. Yes, I have gym shoes and outdoor shoes [that can be further broken down to training, hanging out, trail running and road running]. And, if you know me well, my gym shoes never EVER go outside. My favorites rotate between these beauties. Cinderella was right – the perfect shoe is magical. Gym Outfit: What to wear, what to wear. Pants, sports bra, shirt AND extra socks – [once you forget your socks once, you’ll never forget them again]. Snack : Just incase. Sometimes your gym date is longer than expected, sometimes your body just screams, feed me. It’s always good to have a go to in your bag. Tampons, Face Wipes, Dry Shampoo & Deodorant: All the girly stuff. Because you probably don’t have time for a shower and smelling all day long isn’t exactly attractive. 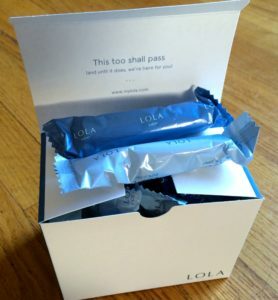 More importantly, have you seen these tampons by Lola? They are 100% organic cotton [they scream natural!] and they are delivered to your door [convenience!]. The packaging is too freakin’ cute too. Check them out here. Towel: I will never use a gym towel, I ALWAYS bring my own. It’s like bowling shoes – I don’t want to wear other people’s shoes and DNA. Headbands and Hair Ties: Headbands and hair ties are non-negotiable. I cannot work out if my hair is going to touch me [strange pet peeve, maybe? we all have them..]. Where do all the lost hair ties go anyway? Seriously, how is it possible to buy an entire package, and weeks later be putting on your own search and rescue mission to find one? Water: Always bring your hydration. Never rely on the gym. What if the water fountain is broken? Resistance Bands: My bands live in my bag. They are a great warm up and a reminder for all of my muscles to get on board. I get questions about what bands I use a lot, so if you are shopping for resistance, check these out [Perform Better Mini Bands]. Lip Gloss: Because lifting weights is manly…? Where did that come from anyways…? I’ll lift, run, sweat, work hard with my lip gloss intact any day. Flip Flops & Towel: Just for those rare occasions when you have time to shower and don’t have to sit in your sweat filled clothes, all the way home. [Drug] Addiction: Life as A Non-Addict. Sister. Daughter. & Can’t Keep Her Mouth Shut Blogger. Ipod, speakers, trx ropes, weights, resistance bands!